Thanks to Drs. K.V. Vinu Balraam and Reena Bharadwaj, Armed Forces Medical College, Pune, Maharashtra (India) for contributing this case and Dr. Hillary Zalaznick, Myriad Genetics, Inc., Utah (USA) for writing the discussion and Dr. Michael Clay for Editorial Review of the discussion. To contribute a Case of the Week, first make sure that we are currently accepting cases, then follow the guidelines on our main Case of the Week page. (1) We are now active on Instagram - @pathoutlines. We will post interesting cases there. (3) Our CME page has a cleaner look, and now has 62 offerings. 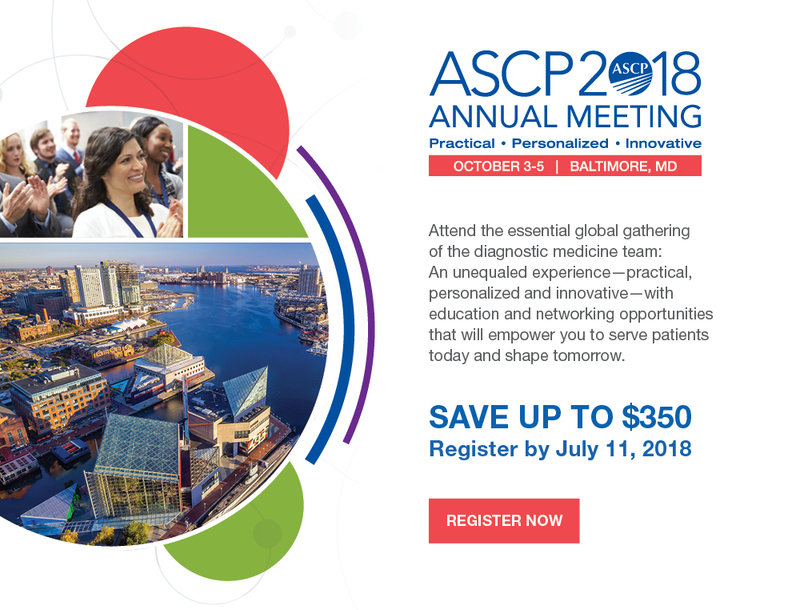 You can search for CME by subspecialty, by organization, by date posted as well as by expiration date (so sign up for CME courses that expire soon). A 39 year old man presented with progressive swelling over his midline scalp. There was no headache, vomiting, seizures, loss of consciousness or trauma. The clinical diagnosis was sebaceous cyst. A planned excision was abandoned due to excessive bleeding. Instead a biopsy was done, reported as an arterio-venous malformation. At neurosurgical consultation, a 10 x 10 cm soft, non tender, non compressible and non pulsatile swelling in the midline fronto-parietal region was detected with no bruit. The remaining examination was unremarkable. MRI revealed a 5.3 x 5.0 x 4.5 cm left parasagittal heterogeneous lesion which was extraaxial, extracranial and intracalvarial. A bifrontal craniotomy was performed with en-bloc removal of the involved bone with the aneurysmal segment of the superior sagittal sinus. 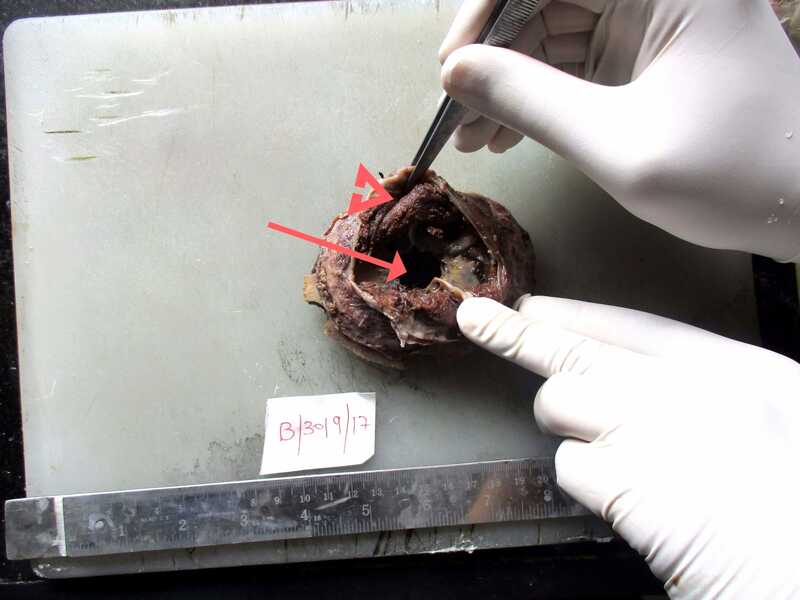 An elliptical craniotomy specimen consisted of a dural base with the superior sagittal sinus, parietal bone with a defect in the center and overlying scalp tissue. A dark brown, spongy tumor, 8.0 x 7.0 x 4.5 cm arose from the superior sagittal sinus, breaching the parietal bone and entering the subgaleal region of the overlying scalp. 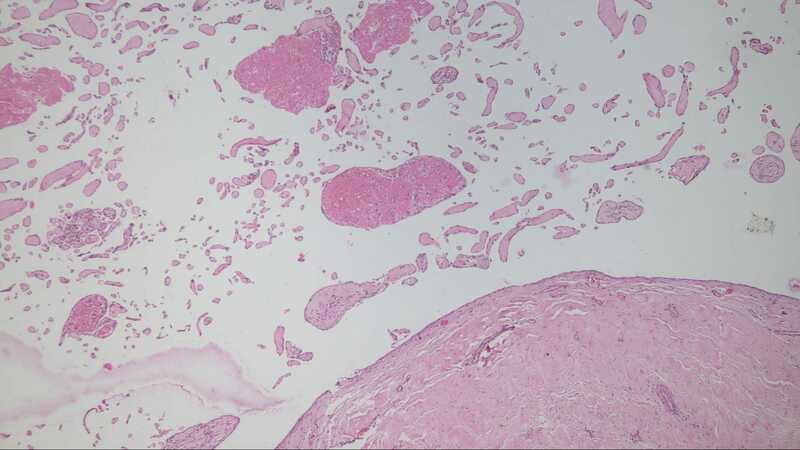 Which of the following features favors a diagnosis of Intravascular papillary endothelial hyperplasia versus angiosarcoma? 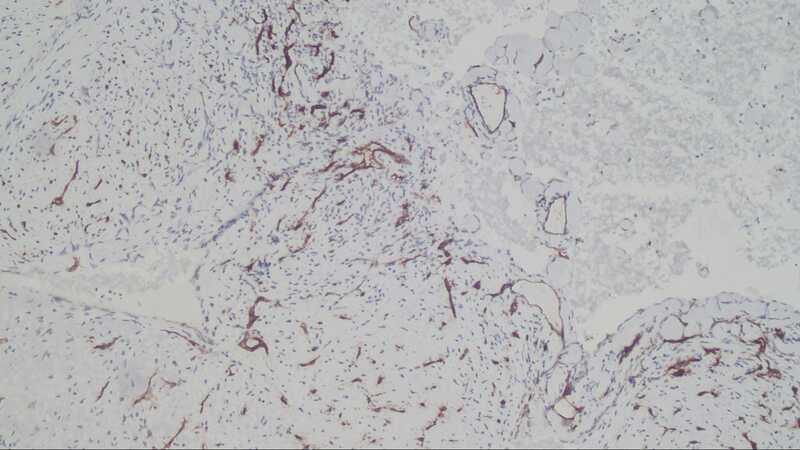 The microscopic images in this case show papillary structures with hyalinized cores lined by a single layer of cytologically bland cells confirmed as endothelial by positive staining for CD31 and CD34. 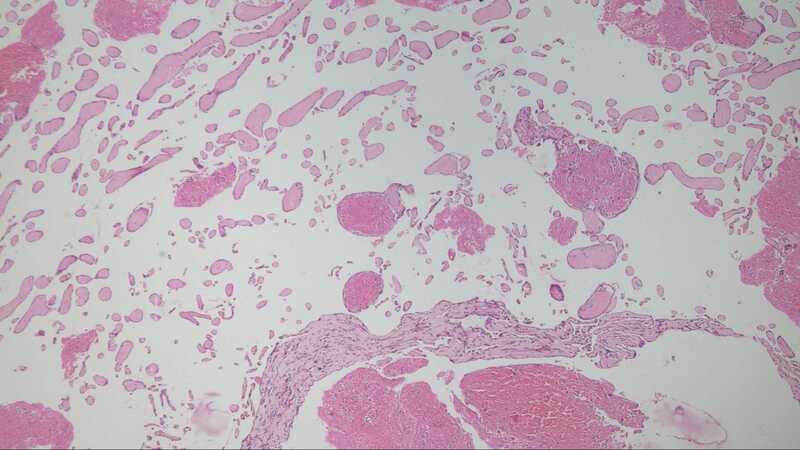 Fragments of thrombus with varying amounts of organization are also present. Ki67 is positive in scattered cells. 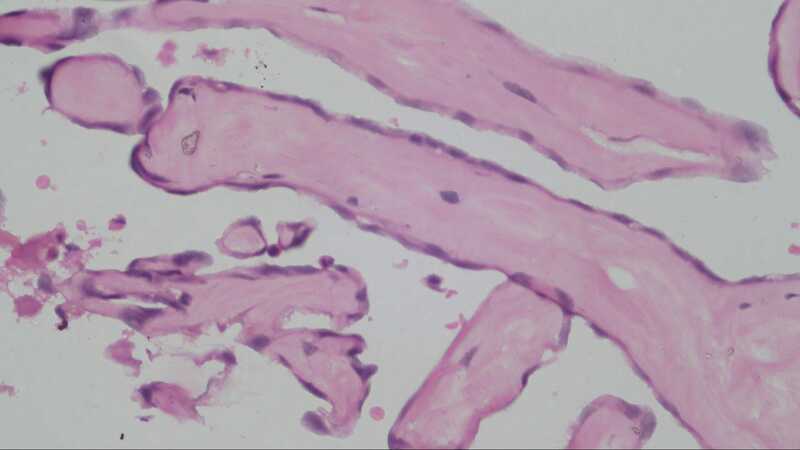 These findings are consistent with intravascular papillary endothelial hyperplasia (IPEH). IPEH has had many names, most commonly "Masson tumor" after Pierre Masson, who first described it in 1923. 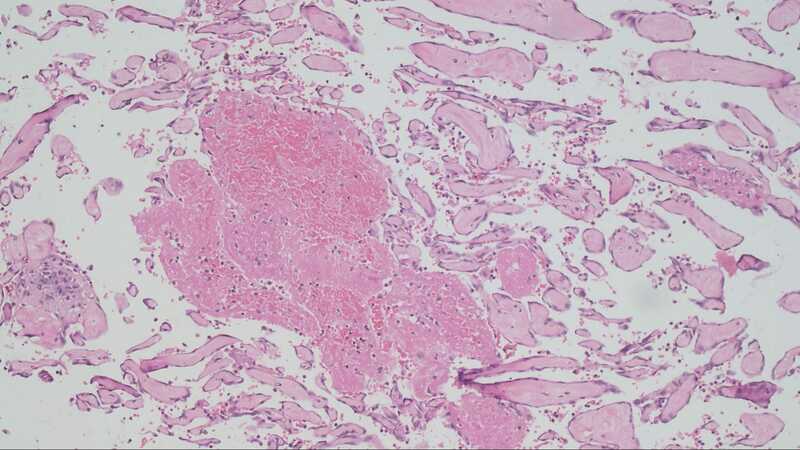 It is a nonneoplastic endothelial proliferation that can be thought of as an "exuberant form of organizing thrombus" (Goldblum, Folpe and Weiss: Enzinger and Weiss's Soft Tissue Tumors, 6th ed. 2014). IPEH can be found within normal vessels (primary or pure type), within pre-existing vascular malformations (secondary or mixed type) and rarely in extravascular hematomas (undetermined or extravascular type). About 40% of cases are the secondary type and arise from lesions such as hemangiomas, pyogenic granulomas, arteriovenous malformations, lymphangiomas and hemorrhoids (Arch Pathol Lab Med 2000;124:1224, Goldblum, Folpe and Weiss: Enzinger and Weiss's Soft Tissue Tumors, 6th ed. 2014). IPEH shows a female predominance and can occur at any age, including neonatal (J Neurooncol 2012;108:211). It is most common in the subcutaneous tissue of the upper extremities, where it presents as a firm, sometimes painful nodule, but it has been reported in locations throughout the body (J Neurooncol 2012;108:211). Grossly the lesions are red-brown or red-purple and contain cystic spaces with clotted blood. There can be a pseudocapsule composed of residual smooth muscle or elastic tissue from the pre-existing vessel wall. 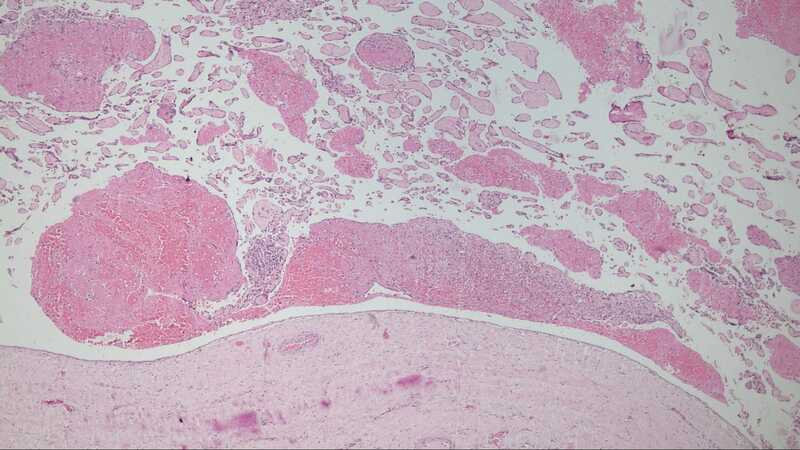 Early lesions show ingrowth of endothelial cells along clumps of fibrin within the thrombus. As the lesion evolves, the papillae become more delicate and the cores collagenize, as seen in this case. In later stages the papillae fuse, resulting in a loose network of anastomotic vessels (Goldblum, Folpe and Weiss: Enzinger and Weiss's Soft Tissue Tumors, 6th ed. 2014). An intracranial location for IPEH is very rare, with only about two dozen cases reported in the literature. The clinical presentation of intracranial lesions depends on the specific location; the most common location appears to be the base of the skull, leading to cranial nerve palsies. Other presentations include increased intracranial pressure, seizure, proptosis, ataxia and hemiparesis. The lesions may cause bony erosion and can mimic malignant tumors on CT and MRI. The lesions often hemorrhage and can cause significant intraoperative bleeding (J Neurosurg Pediatr 2015;15:384), as seen in this case. The differential diagnosis for this case includes angiomatous meningioma and angiosarcoma. Angiomatous meningioma has abundant vascular channels, a dural attachment (unlike IPEH), and the blood vessels are mostly small with markedly hyalinzed walls. Tumor cells may be sparse and not particularly meningothelial-looking; Positive staining with EMA can help confirm the diagnosis (WHO Classification of Tumours of the Central Nervous System, 4th ed., 2007). 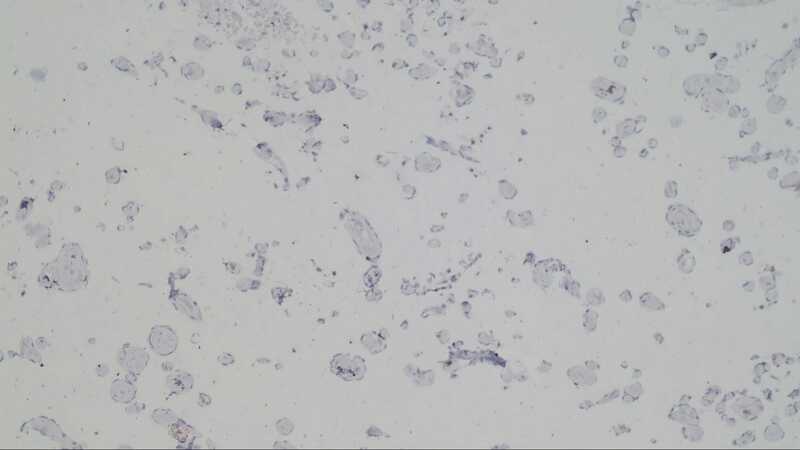 IPEH is often confused with angiosarcoma but IPEH has a single layer of cells on the papillae, no cytologic atypia, no nuclear pleomorphism and no necrosis. Additionally, angiosarcomas are almost never confined within a blood vessel (Goldblum, Folpe and Weiss: Enzinger and Weiss's Soft Tissue Tumors, 6th ed. 2014). 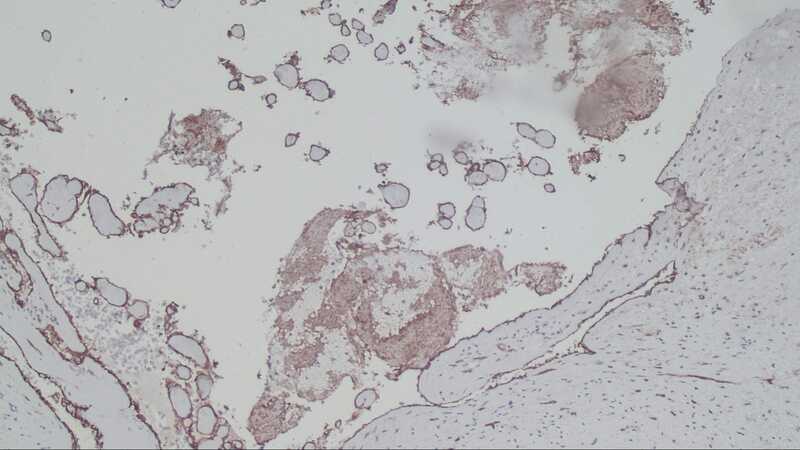 Ki67 staining in IPEH can be high (the case described in J Neurosurg Pediatr 2015;15:384 had more than 30% staining), but no abnormal mitotic figures are present and the mitotic rate in angiosarcomas is much higher than in IPEH (Arch Pathol Lab Med 2000;124:1224; Goldblum, Folpe and Weiss: Enzinger and Weiss's Soft Tissue Tumors, 6th ed. 2014). Complete resection is recommended for IPEH and is typically curative. However intracranial lesions are not always amenable to complete resection and unresected areas are at risk of intracranial bleeds. Occasionally IPEH can regress, but lesions typically either remain the same size or grow, sometimes dramatically. Radiation and chemotherapy have been used successfully to stabilize lesions. Long term follow up is recommended since late recurrences have been reported (J Neurooncol 2012;108:211). C. Papillary structures lined by a single layer of bland cells. 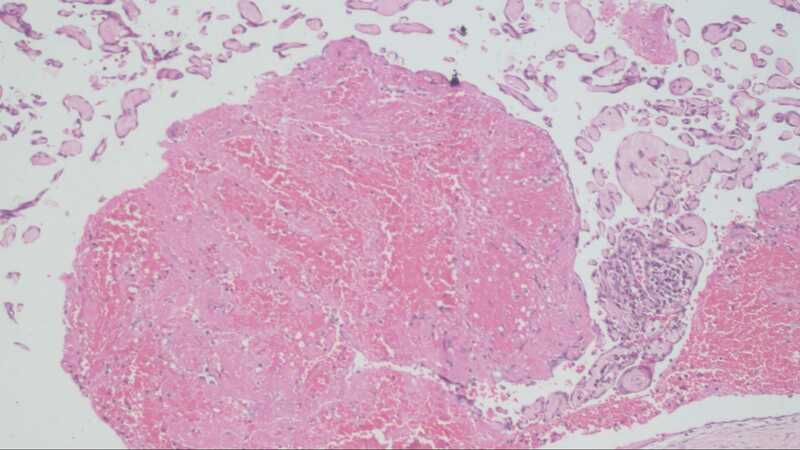 Both IPEH and angiosarcoma can grow outside of a vascular structure; however, purely intravascular growth favors IPEH. Choice B would be seen in angiosarcoma. Both entities stain positively with vascular markers.